I'm very exited to let you know about the upcoming Mindful Parenting eBundle Sale, organized by Jennifer from Hybrid Rasta Mama, Laura from Authentic Parenting, and (me) Lauren from Hobo Mama. The bundle is 21 titles by esteemed parenting authors. I'm an organizer, contributor, and affiliate of the bundle (nothing like multitasking! ), so I'm really excited about this upcoming sale. It starts May 28 and lasts for only 12 days. If you were wondering why I've been taking a wee vacation from blogging, this is why! Organizing this bundle sale has been a ton of really rewarding work, and I'm so pleased to introduce you to this incredible group of resources. 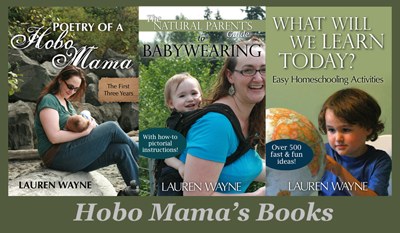 Among the resources is my own e-book, Poetry of a Hobo Mama, a collection of poems inspired by my first three years of parenting Mikko. You can read reviews and excerpts for my book here. These 21 resources are a total value of $236 but will be available for the incredible price of $24.95! Plus a lovely freebie by Jennifer Saleem of Hybrid Rasta Mama: The Mindful Mothering Challenge. This bundle is available only from MAY 28 to JUNE 10. After that, these products will never be sold together again at this price! Find out everything about the sale at Mindful Nurturing. Are you a blogger who loves gentle parenting and would like to make some money as you blog? We're still looking for affiliates! Affiliates receive a 50% commission, which translates to over $12 per sale! A full toolkit with imagery, text and much more is available for your convenience in promoting this amazing ebundle. Sign up now, or visit Mindful Nurturing for more information!